Now I know what you're thinking: please God, not another style blogger with this neck tie thing! And all I have to say to that is: guilty as charged. I live in NY, a city known for it's violent past, so you can imagine my immediate concerns when this trend rose to fame. But after rocking it a bit and having it grow on me I seriously need professional help to lay off it. I tend to stick to traditional colors when it comes to neckerchief choices, usually sporting a blue, white, black or red one. I find that these colors work best with most outfits I put together so they're the first one I reach for. And can we talk about how they just oomph up any dull outfit for a sec? You can legit be rocking a potato sack, throw a neckerchief on and BAM- New York Fashion Week ready! So what are your thoughts on the trend? Are you hoping we say keep it for fall or kiss it goodbye? You always rock that trend and every time I see it, I love it! Such a perfect little addition to any outfit! The bandana looks so cute with those shorts!! Love it! The stripe shorts and my favorite sunglasses are obviously my favorite on this look. Perfect summer look. Love everything about this outfit, that bag is such a lovely colour! The necktie really suits you, I wish I could pull one off but I'm just not brave enough! That bucket bag is gorgeous! Such a great color. 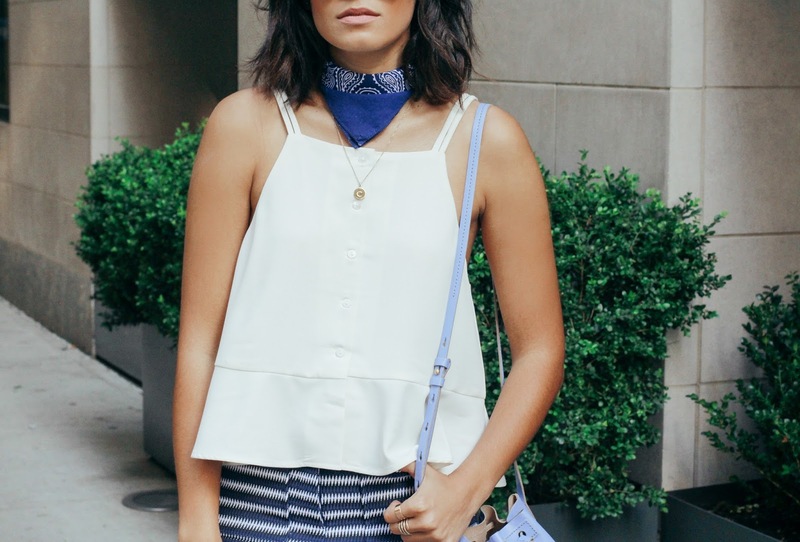 I love the neck scarf trend, its not really taken off massively in the uk but im keen to get on it and rock it like you are in this outfit! Blue is one of my favorite colors. You look wonderful in this cute summer look. We love the color of the pastel blue bag! so gorg! So jealous of the shoes! Great combo with the bucket bag. I love this necktie on you!! And omg, your shoes are so gorgeous! Love this casual outfit. Like your bag too. you look so cute! I love the striped shorts! Lovely post, dear! I'm seriously inlove with the whole concept of your blog and this look! You styled the neckerchief beautifully and look very chic. This is my definition of effortlessly cool. 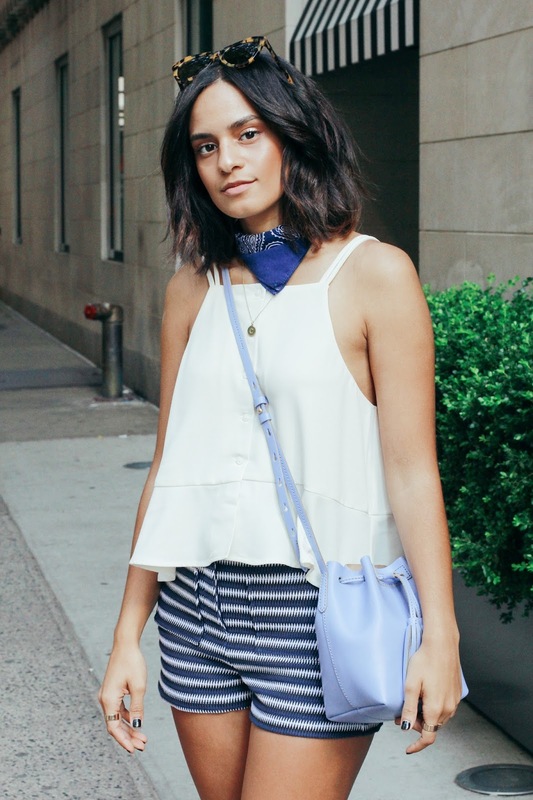 I love your neck scarf, and I need to learn how to get my hair into loose waves like yours! You look so beautiful!! Nice style! love the style. you look so cute.